And here is the final installment of Slovak Christmas cookies – at least for this year. Although, technically, šuhajdy, ganache filled chocolate cups, are not cookies. They are not baked. And so, they are in class with rum balls, easy to make, no-bake dessert spheres of bliss. But that doesn’t mean they don’t belong here. Šuhajdy are a popular part of Slovak (and Czech) Christmas table, due to being really simple to make and extremely delicious. This recipe comes from my grandma Pavka (and was emailed in by my cousin Katka). 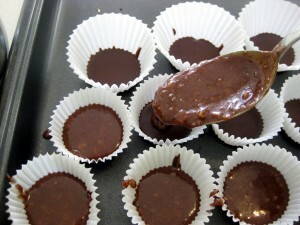 I adapted it a bit by adding coconut flakes to the filling. Besides the ingredients below, you will also need muffin cups. I recommend the mini size, because these treats are super rich, and the tiny ones are just enough. Start by melting the chocolate. I didn’t really pay too close attention to the amount of each ingredient. I started by melting 3 squares, but the chocolate was too thin so I added another two. 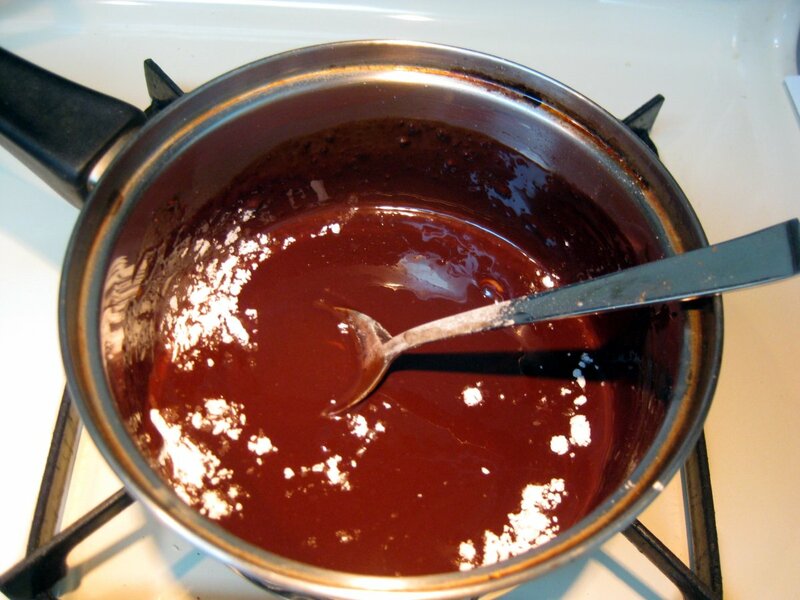 Roughly, the ratio of chocolate to the fat should range between 3:1 to 2:1. You can use a double boiler (one pot immersed in another one containing boiling water), but I find this not necessary. Just place the pot on the smallest burner your stove has, and turn it to the lowest setting. 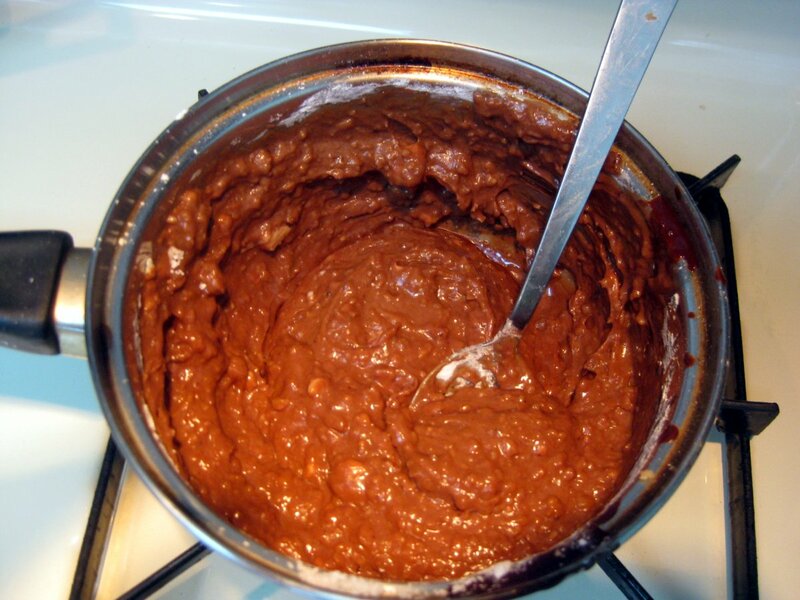 Keep stirring so the chocolate doesn’t burn. Also, do not fully melt it, turn the heat off when there is still a small piece of solid chocolate left. This way, the piece will melt from the residual heat, but won’t get hot enough to de-temper the chocolate. 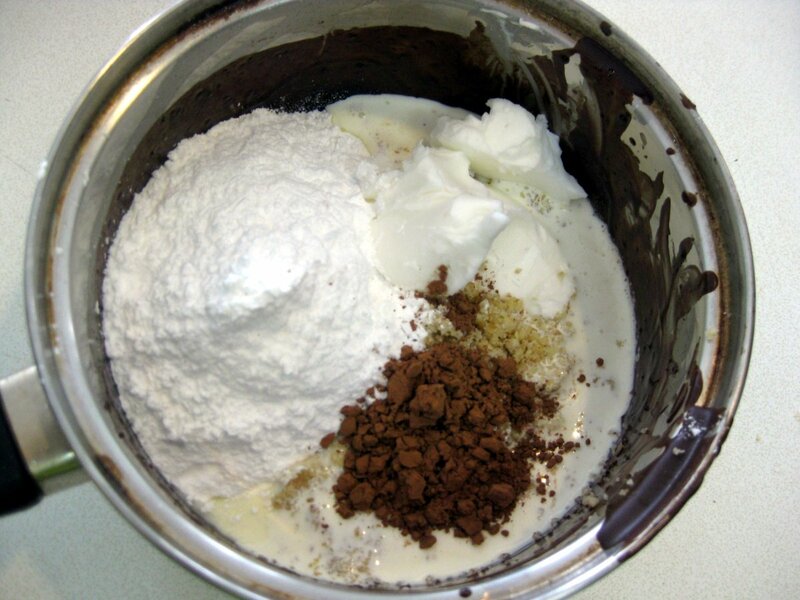 You can also add cocoa and powdered sugar to taste. 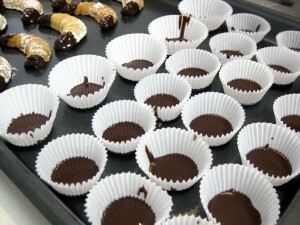 Arrange the muffin baskets on a tray (I used a baking sheet), and pour in about a tablespoon of chocolate into each cup. 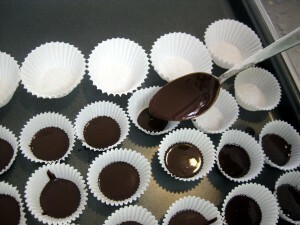 Pour it in close to the center, so the chocolate distributes evenly all around. Make sure to save half the chocolate for later. Place in a cool place or the fridge to allow the chocolate to set. I think it’s better to use a cold basement than the fridge, since the drastic change in temperature between the outside and the fridge (usually just few degrees above freezing) can cause the chocolate to crack or turn murky. Šuhajdy are made of three layers, and the middle layer is sweet ganache cream filling. 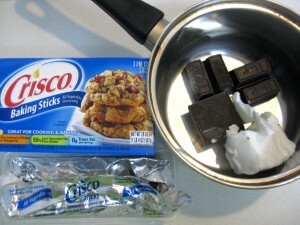 To make it, simply combine sugar, cocoa, flavoring, milk or cream, and solid fat (Crisco) in a pot. Bring to boil on low heat. Let go through the boil for a minute, while continuously stirring. Another way you could make it is by first scalding the milk and then pouring it over the mixture of sugar, nuts, and fats. As far as the flavor goes, feel free to experiment with what you like. There are basically two kinds of šuhajdy: nut (orechy) and coconut (kokos). I used bit of each! What looks like ground nuts in the picture above is actually roughly equal combination by volume of hazelnuts, walnuts and coconut flakes, which I ran through the blender. I didn’t use any alcohol, but a shot of rum would blend in nicely. Bring the chocolate baskets up from your basement or the fridge, and spoon in the filling. The filling is much thicker than the thin chocolate, so you really need to make sure to pour it in the middle so that you get a smooth, level layer. 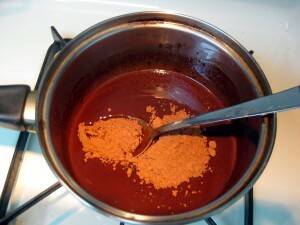 Also remelt the second half of chocolate (or make more if you ran out), and top off the baskets. 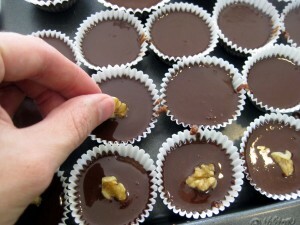 Then top each cup with a walnut. Place in a cool place to allow the chocolate to set. That’s it. Very easy and super delicious. Enjoy! How do you make šuhajdy? Please share your recipe. Thank you! 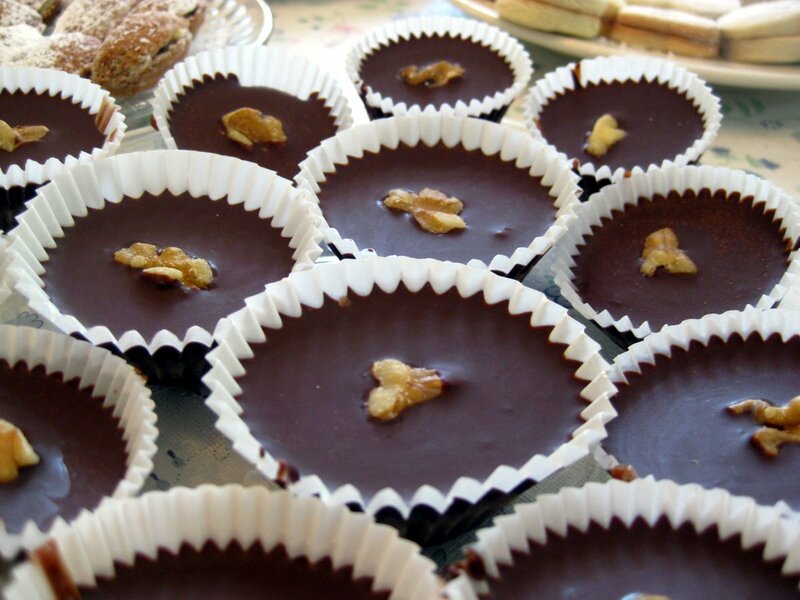 It just occurred to me today that šuhajdy are quite similar to Reese’s Pieces butter cups, except that the filling is different. Can you use butter instead of cris I? Would like to make these for a wedding (family tradition to bring cookies), if I make them the weekend before will they stay good? Fridge or freeze?